MSV: Councilwoman Tiffanie Fisher: "Today we received a second bite at the apple"
Councilwoman Tiffanie Fisher: "Today we received a second bite at the apple"
I first want to say what I often say - More Voices are Better. Followed by another top choice of mine - Your Voice Matters. 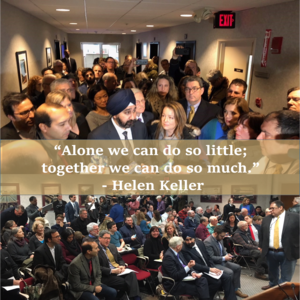 We had one mayor, five council members, advocacy groups and over 100 Hoboken residents attend the meeting today and TOGETHER we showed NJ Transit how important this decision was to Hoboken. And even though we did not speak individually, our crowd spoke volumes, and they heard us. As I said yesterday, what a delay gets us is more time. More time to get in a room with all stakeholders. More time to find the way to complete our waterfront that started 30 years ago. But as importantly, more time to try to help find a solution that supports the critical ferry service used by 30,000 commuters each day (2,000 Hoboken residents). We are expecting NJ Transit and NYWW to be part of our solution, we need to be part of theirs. It was unfortunate that on a day we should have been honoring the legacy of MLK and his commitment to service, we had to be distracted with the need to protest. So if you too were distracted by all this, here is a great piece that I found to inspire you to make a difference any day. All the ways you can make a difference this MLK Day. Please call me (201-208-1674) or email me (hoboken2nd@gmail.com) if you have any questions or want to discuss.